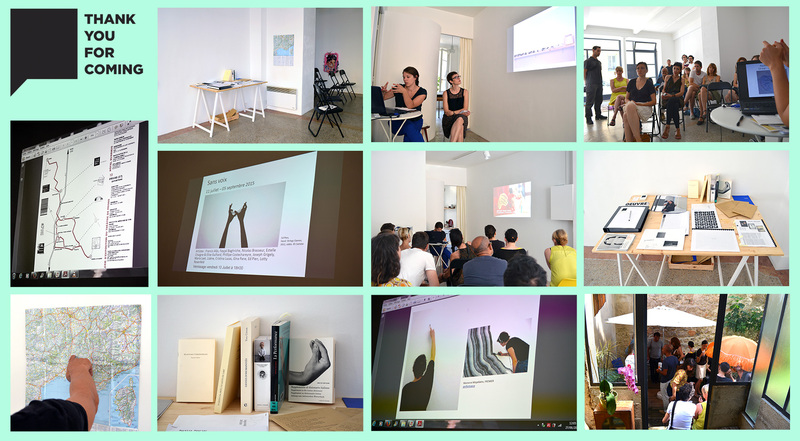 In 2015, thankyouforcoming sets up a series of short residencies for critics and curators which operates as a reciprocated invitation between Nice and other cities in France and abroad. The ACROSS (scenes de province) program is a collaborative, participative and experimental project which aims to bring a special kind of exposure to different artistic scenes and raises questions about uses of mobility. This year, ACROSS will welcome five residents coming from three different places: Privas, Nantes and Strasbourg. To inaugurate this cycle of residencies and encounters, thankyouforcoming invites Camille Planeix to come and talk about her curatorial practice, which will take place at Le 22 Gallery, on the Saturday the 27th of June at 11AM. Camille Planeix is curator and director of Galerie d’exposition du Théâtre de Privas / Espace d’art contemporain (Ardèche) since 2014. She will present the different stages of her career and her own views about curatorial practices today. She will also give an insight of some of the art scenes from her region and of her first year working at the Théâtre de Privas Gallery with the associate artists. Finally she will reveal the gallery next year program. It will be a time to discuss and exchange among the participants afterwards. Come along! After completing her studies in History and Art History, Camille Planeix collaborates in 2008 and 2010 with Raphaële Jeune to the two first editions of Ateliers des Rennes – contemporary art bienniale. In 2011, she founds the « Rien que pour vous » association with Thomas Tudoux. It focuses on promoting and giving support to artists. From 2011 to 2014n Camille Planeix works along with Béatrice Josse in coordinating 49 Nord 6 Est – Frac Lorraine, and Frac Nord-Pas-de-Calais and running the diffusion of the collection. Since November 2014, she is head of the Théâtre de Privas Gallery / Contemporary Space program. She develops five exhibitions every year around a central theme. In 2015 the theme is called « D’un geste à l’autre »/ « From one gesture to another ». Writing (the rebellious gesture), drawing (the descriptive gesture), dancing (the pure gesture), doing (the technical gesture at work) are the many actions and types of body movements carrying signs or not, that Camille Planeix will explore, question, perform, show and express through her propositions in 2015.